Garden Furniture Blog, Coffee Tables And Rattan Dining Chairs Blog - Gardenart - Outdoor furniture, what kind of good material? Outdoor furniture, what kind of good material? Most of the outdoor furniture are suitable for open use, but different materials have their own characteristics, according to individual needs and preferences to choose. PE rattan outdoor furniture for the appearance of imitation rattan effect, a weaving sense, the overall style biased in favor of naturalism, more casual and practical. This material has a smooth surface, good flexibility, anti-UV UV does not fade, easy to clean, etc., especially for outdoor use, not only rain, easy to scrub, do not have to spend too much care on the mind, only need to use Soft brush, rag or vacuum cleaner, usually pay attention to prevent the collision, the tip or hard to scratch it. Iron furniture, as the name suggests is the iron as the material of the furniture, due to the characteristics of the metal material itself, combined with the texture and color of the metal itself, making the iron furniture has a more obvious characteristics of the summer, its metal material unique wind resistance, anti- Moth and other characteristics make it also suitable for outdoor use. 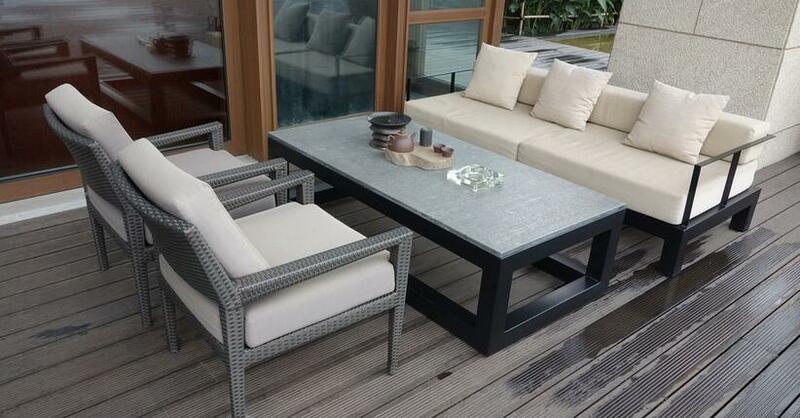 But compared with the PE rattan, iron furniture is not so resistant to acid, although most of the outdoor iron furniture have been anti-corrosion treatment, in general, 35 years will not easily rust, but if used and improper maintenance, will soon lose the metal luster. Rotational plastic furniture in recent years, the emergence of relatively new outdoor furniture, the material that white is plastic, rotomolding in fact refers to the integration of plastic molding processing methods. Rolling plastic outdoor furniture using PE environmental material rotomoulding a molding, there are a variety of sizes and different styles of style, the current mainstream style biased towards modern, strong sense of design, lines simple and rounded; color mostly white, and most built-in colorful LED Lights, remote control lights to adjust the light and dark colors, to better create an outdoor garden atmosphere, if often open in the garden, then, rotomolding furniture is a good choice.